Is Casablanca one of the unluckiest names a restaurant could have? Granted, there is a fair amount of mayhem surrounding restaurants and cafes generally, at least judging from newspaper stories, but places with this name seem to have attracted more than their share of violent crime. He is not alone. When I recently posted a photo of an old no-tell motel, the Coral Courts, on my hometown’s Facebook page, interest was notable. Likewise someone’s FB post recalling a horrid massacre at a roadhouse called Cousin Hugo’s just outside the borders of that formerly dry and ultra-proper suburb attracted comments like a magnet. 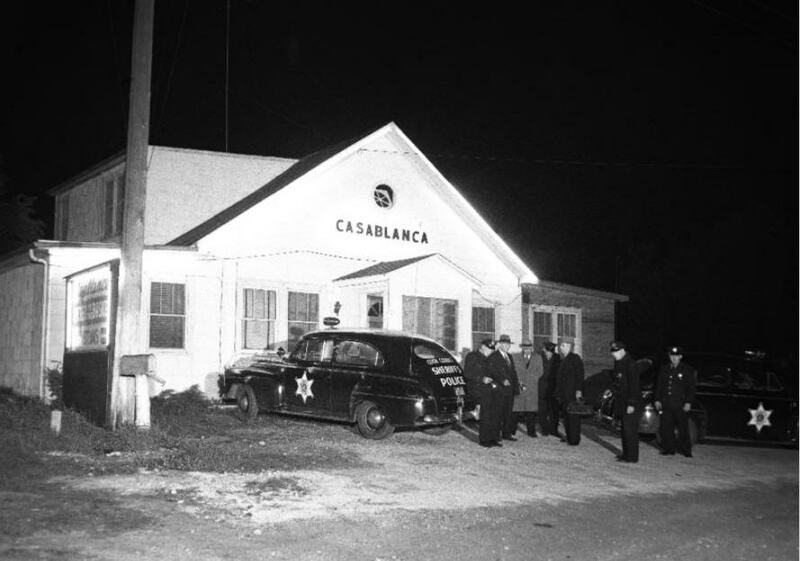 The Casablanca on Rand and Dundee Roads in Palatine was begun by Loretta Cooper, daughter of Polish immigrants in Chicago. She may have opened it in the early 1940s, but under another, unknown name. She would have been about 25 years old and already 7 years into her restaurant career. 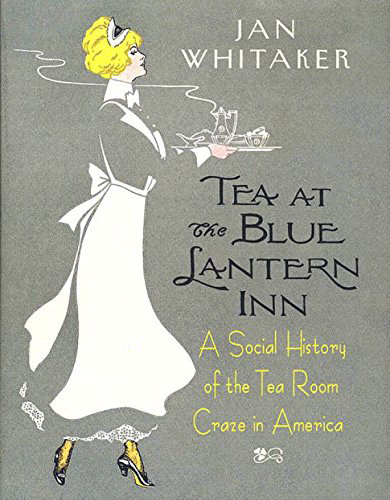 She started her first cafe, the Star Tavern in Chicago, around 1935 when she was only 18. Being underage she needed her older brother to act as the nominal manager. 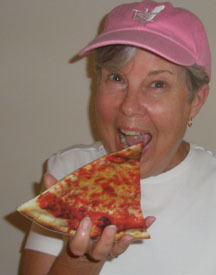 Loretta proved to be a “survivor” in the restaurant business, owning a number of establishments over at least a 30-year period. She didn’t run the Casablanca for long, though, because by 1943 she had taken over the old Eddie’s Castle Café on Evergreen in Arlington Heights IL and renamed it Loretta’s Castle Café. 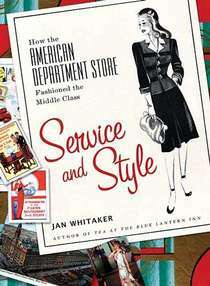 It stayed in business until the late 1960s when the building was demolished. She and her husband Edward also ran a place in Arlington Heights called Cooper’s. Loretta sold the roadhouse to Michael Buny around 1944 and he renamed it Casablanca after the Humphrey Bogart film that had come out two years earlier (thanks to his family member for this piece of the story). In May of 1949 he was killed in a holdup. When two hooded men entered the roadhouse one night with shotguns, he attempted to foil them by sneaking outside through the kitchen and getting a gun, evidently planning to ambush them when they left. He was shot by lookouts watching from the getaway car. Although the police rounded up suspects who went on trial in the early 1950s no convictions were secured. Years later one of the suspects was apprehended for home repair fraud. 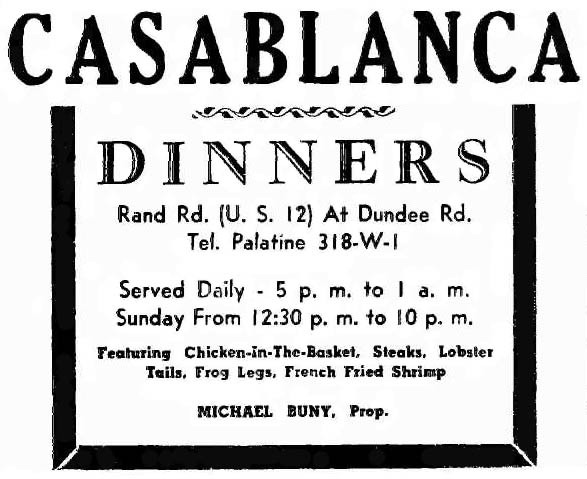 Michael Buny’s wife and daughter ran the Casablanca after his death. In 1951, about two years after her father’s slaying, daughter Darlene was shot in the shoulder as she struggled with a tall scar-faced robber who broke into the café one night. It’s uncertain how long she kept the Casablanca going after that. Quite by coincidence, I assume, a nightclub restaurant opened on Dundee Road in Palatine in the 1980s called Bogie’s, with decor inspired by the film Casablanca. Local history would have made for a riskier theme. I used to live and work in that area and find this whole story fascinating. There is an old speak easy that is still in operation as a restaurant on a small lake in N. IL They of course play up on the mob connection and have a packed house every night. It is a former hideout of Al Capone’s. Murphy, don’t forget the restaurant that had the highest Zagat rating in the entire Chicago Area, just across the street from the Weber Kettle (I am pretty sure these are all in Wheeling though, not Palatine but very close), Le Francais. It is gone now too, though on that same block Bob Chin’s is still thriving. It is the fourth top grossing restaurant in the United States. A random comment, granted, but Palatine has a warm place in my culinary heart as the home of the Weber Kettle. Many years of happy grilling and still going strong!